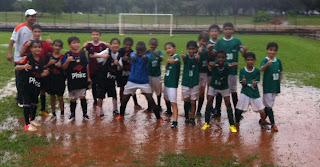 Last Saturday the HS team played two games against the Escola Francesa on a society field, 8 v 8. These were a great games, Letsie, Adnan and Huat Thart scored the goals for the Eagles. Highlights were Huat Thart crossing for Adnan to head it into the goal, and Letsie's pass over the goalie for Huat Thart to run into the goal with the ball. Those were awesome goals!!! 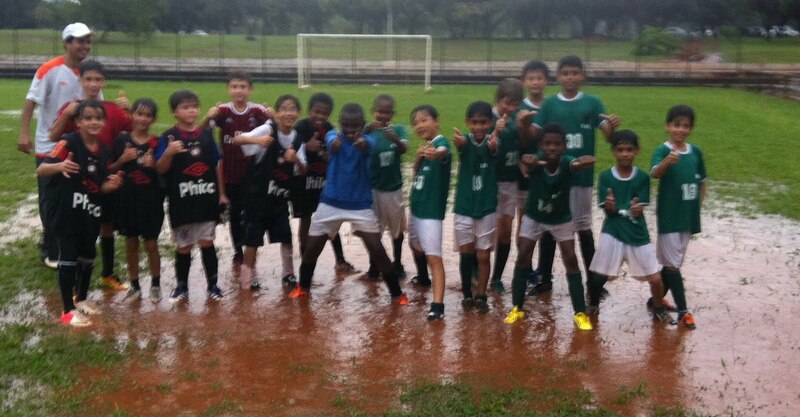 Yesterday (04/10/13) we played against Atlético Paranaense at UnB under some heavy rain. We had a great time playing on the big official size field. Letsie, Adnan and Kwame scored the goals for us. In the final score we lost 8 to 4. My number is 81442220. Batista. Call if u need anything. At this point we are still on for the soccer game. Hope to see you guys there. Coach Batista. It is 1:34pm now. Click on this link to print the sign up form. For questions contact CoachBatista@gmail.com . Hope you can join us! Please check the after school club you would like your child to participate in. 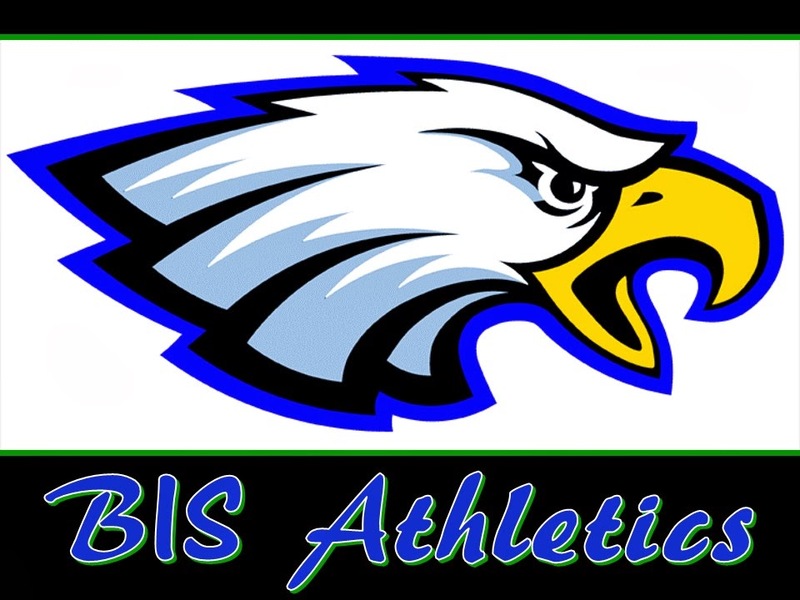 Clubs will meet from 3:30 pm until 4:30 pm on Tuesdays, Wednesdays, and Thursdays starting on April 16th and ending on May 23rd Students must be picked up from BIS promptly at 4:30pm. Each club will meet a total of 6 weeks. Please send the appropriate amount with the signed form by Monday, April 15th . (NO CHECKS PLEASE). Space is limited in each club so please turn in your registration form as soon as possible to reserve your child's spot. ______Capoeira club (Tuesday only) R75 for the club session (6 lessons). ______Capoeira instruments (Thursday only) R75 for the club session (6 lessons). 2013 Clubs – April 16th to May 23rd (6 sessions). "Video-game & Hang Out Club" - This club is open to students in pre-school 4 to 12th grade and it will be led by Mr. Knutson. This club is designed to help families who have children doing multiple activities at BIS. In this club students will have a chance to play video-games on a BIG screen (wii, x-box, etc), play cards, do their homework (by themselves without teacher assistance), or simply hang out while their siblings are doing a different club. This way all children can go home at the same time in one vehicle. Students in this club are encouraged to bring a snack in case they get hungry. This club is available to BIS students only. Cost R$25. Capoeira - This club is open to students in Kindergarten to 8th grade and it will be lead by Capoeira instructor, Aladin, assisted by Coach Batista. Capoeira is a Brazilian dance/ martial art developed by the African slaves who helped colonize Brazil in the 1500's. Students will learn the fundamental steps (jinga) of capoeira, along with different songs and moves that make up the capoeira experience. This will be an amazing club and a great Brazilian cultural experience! This club will be offered all year long. - Capoeria team (Tuesday and Thursday) R$70 per month (8 lessons). - Capoeira club (Tuesday only) R75 for the club session (6 lessons). - Capoeira instruments (Thursday only) R$75 for the club session (6 lessons). o In the instrument club students will learn how to play the Pandeiro, Atabaque (drums), and Berimbal. "Summer Camp" club - This club is open to students in Preschool 4 to 2nd grade and it will be lead by Mrs. Knutson. In this club students will play typical games of summer camp (like capture the flag, tug-of-war, etc) and make different snacks and crafts that are also part of the summer camp experience. This should be a super FUN club for the kids. Cost R$75. "Summer Games" club . This club is open to students in 3rd to 8th grade and it will be lead by Coach Batista. In this club we will play several fun games that encourage team work, strategy, hard work and honesty. The summer games will include capture the flag, tug-of-war, water balloons and more! It will be a LOT of fun! Cost R$75. Club for Parents of Third Culture Kids (TCKs). This club is open to all parents and it will be lead by Mrs. Boggan. Cost – Free. Have you ever felt at a loss as to how help your children and keep your sanity as you travel and live all over the world? You are NOT alone!!! Join us as we share our experiences and help encourage one another as we raise children who will be the future world changers! Facilitated by Connie Boggan, the mother of seven TCKs, we will discuss ways we can help our children thrive in new cultures and adapt to the many changes and challenges they (and we) face. Please don't let your limited English keep you from coming - we are all growing and learning together! See you there! This will be a free club. Also consider the "Hang Out Club" if you have multiple kids. One child could do a club, while the other stays in the "Hang Out Club" with Mr. Knutson J. Remember that students participating in clubs must be picked up at 4:30pm. 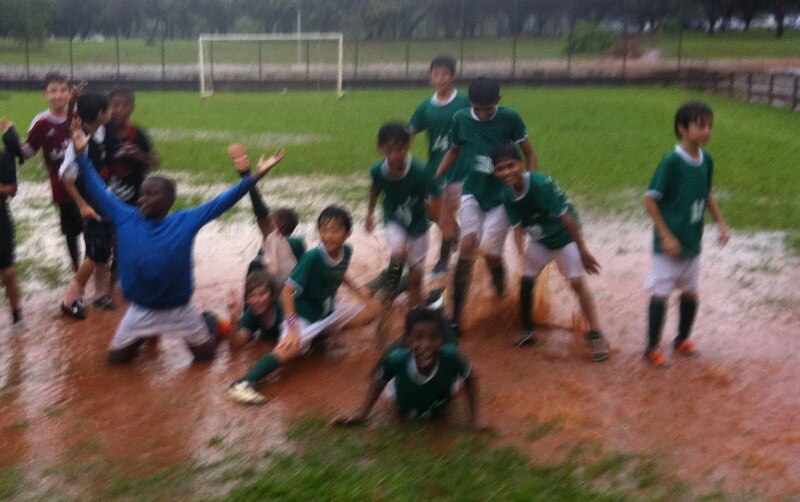 The boys had another game against EAB today. It was a little bit windy and rainy but otherwise it was a beautiful day for a softball game. The EAB boys ended up winning but overall it was a great game. The final score was 21-16. There was a couple of highlight plays. Gustavo had the catch of the day even though Mr. K ran him over trying to catch the ball. Mr. K hit him like he was playing football but he still managed to hold onto the ball. Letsie was his usually steady self in right field with his normal, everyday catches. Frizald almost had the catch of the day. He caught it in his glove, it popped out and hit him on the head. It then was dropping to the ground and he dove for it and almost caught it with his bare hands. Ben hit a inside the park home run that scored Letsie and Mr. K.
Zeeshon was pitching as usual and made several great defensive plays. Alan was catcher and had some great hits. Mr. Axeworthy was a great 1st baseman, Mr. Lancaster subbed in and had some great hits and great defensive plays. Mr. Batista was in center field and a made a great running catch. Everybody hit the ball extremely well and played great defense. It was a great improvement from last game. Girls Softball game. Saturday 9 A.M. at EAB. Last game of the year.